How to look after your skin in your 30’s and cheat the time. First of all, one and the most important thing is to look back into your younger age. I know many of my friends who overused sunbeds, makeup, and parties. Well, I am very guilty of the last one as well. One thing I was always avoiding, is using too many skin care products. I think, it really benefited my skin. Some of my wealthier friends were spending so much money on expensive creams, under eyes creams and all magical face washing creams. Instead, I just used soap and simple moisturizing cream during my teenage years. This was down to me simply couldn’t afford the expensive stuff. Over the years, I could see how the skin of my female friends was getting so dependent on these, and while they were applying more and more, mine was still alright. I only started a proper skin routine in around the age of 25. Then, I have reached for under eye creams, I started buying more expensive foundations and started paying attention to a cleansing routine. I was partying, smoking and drinking like every girl in my age, but same time I have never used heavy makeup. My make up was always down to the foundation, mascara, and lipgloss! It’s been only very recently, where I discovered contouring and amazing products. 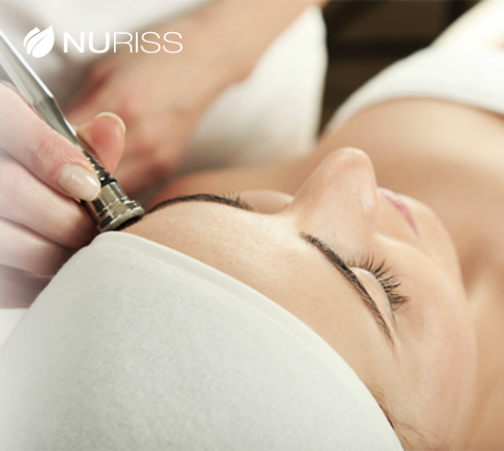 Since then, I also started regularly visit beauty salon like Nuriss and doing facial-treatments. As much as I couldn’t see the importance of if when I was 20, then I can see how much difference it does to my skin now. The technology and advanced products that they used in skin clinics really helps and benefit my skin. Many of my friends in their earlier 20s are talking about botox and other anti-ageing solution and personally, I am quite scared of these. I try as much as I can look after my skin naturally and only reach for products that are well-known brands or go to beauty clinic that also has a good reputation and positive reviews. When I look for great skincare products, I source them from a well known places like House of Fraser but also I use loads of natural products from The Body Shop. I often attend press days, beauty events and I try to always look around the skin products as I know how important for me now is to focus on my skin. Apart from my daily skin routine, I have 18 top tips for you, how to make your skin look younger and cheat the time. I know, I am not a beauty blogger, but these are based on my very own experience. 1. Drink water. I always try to drink at least 1litre of water a day. I know it’s recommended more, but physically I just can’t! If you can’t drink plain water like me, it’s worth to look into fruit bottles. I tried this citrus zinger and is a lifesaver as you not only top up a water but also get extra fruit vitamins! 2. Herbal & detox teas. I usually try to drink these as a supplement of the water I can’t drink. My favorite is green tea, chamomile and peppermint tea. I also love to try any new taste of these like strawberry green tea or beauty teas. I also drink detox tea’s. I have previously talked about benefit of skinny tea’s and now I tried the detox one and honestly it helps my skin so much. I love this Ortte tea, I was recently send to try. 3. Quit smoking. I used to smoke when I was a teenager and since everyone knows it’s hard I actually quit smoking for 5 years! I no longer smoke throughout the day but I am guilty of ‘’social smoking’’ while on a night out but since is like once or twice a month I am really hoping to even quit that! I think, this was a huge factor of my skin being in a much better condition now. 4. Avoid alcohol as much as you can. Again, I am not an angel and everyone knows I love prosecco. However, this perhaps is the only drink you will catch me with. I never drink at home. Some people enjoy a glass of red or white in the evening and I simply don’t. It’s very rare and must be a special occasion where you will see me posting a selfie with a glass. Perhaps, it happens twice a year, that I was enjoying a bath with a glass. I think social drinking once a month definitely helps to keep your skin younger, than drinking a glass of red every night. 5. Smoothies. I can’t generic topamax reviews even stress how much I love them! I drink at least once smoothie a day. It’s either veggie or fruit one, depends on of my mood. 6. Face mask every Saturday. (well my chosen day by pick any day!) This became my routine now. I use 4 different face masks a month, so I always make sure my skin gets moisturized or clean. 7. Face peeling. Before applying mask I use peelings, always! It helps get your skin ready for your mask! 8. No, makeup days. I have probably 80% of this per week. I only wear makeup if I go out. Any other day, I keep my skin make up free and just make sure it’s moisturized. That’s all. 9. Face toner and makeup remover. I always remove all makeup before sleep and use a toner to make sure skin is cleaned properly. This is so important. I am very guilty of nights when I was too tired and despite my pillow looked like someone been murdered, then next day it was 100% wake up with a spot on my face. Gross! 10. Face massage. After each mask, I always try to do a 10min face massage. I just use my palms and gently tap my cream for 10 min massaging my skin. 11. Using natural products like strawberries, cucumber, or even tea bags as skin care. When I got a minute during a week, I always try to chop a strawberry and use this as mask or cucumber on my eyes. This is my mum’s method and believe me, she had already me and my brother and she looked like she had siblings in push pram! 12. Allowing my skin go oily. I don’t know what it is with it, but it’s something I was told years before by my beautician and she advised not to over clean skin or put too many products. I apply cream in the morning, and wait until evening to remove and clean my skin. I don’t do it multiple times throughout the day. Sometimes, I had events where I had to wake up early and go to multiple events, changing my makeup few times and I noticed, that multiple times cleaning my skin only make it dry. 13. Quality makeup. At this age, you shouldn’t really buy cheap makeup anymore. At this age, you should really pay attention to ingredients of your makeup as well. Recently, contouring is very popular and I love Iconic London cream contour palette, but again don’t overuse it! It can clogs pores and make you look older instead. I really apply my makeup very gentle and having less makeup makes me look younger, not the other way round! 14. Clean your makeup brushes. At least once a week. A lot of bacteria can stay on your makeup brushes and cleaning them once a week you keep your skin cleaner, therefore looking younger! Ah same applies for a beauty blender! 15. Eat well & exercise. This perhaps is very obvious but some people don’t realize how much difference can bring having a healthy porridge with fruits than bacon bap from Greegs! Also, I exercise 10min every day!I know, it’s not much, but it’s enough for me to start a day and if feel I need more, I just do. I am not a fitness fanatic but I do yoga regularly at home. 16. Top up your vitamins. I also take vitamins to help my skin. I often work late hours and there are days where I feel under the weather. Vitamins helps me especially though those days, where I have event after event and run like crazy all day, not having a time for a proper meal. My favorite is Seven Seas, I was sent this as trial and love it! 18. Avoid too many coffees. One coffee a day is enough. I learned this a hard way. I never drank coffee and then I started working in an office and drank 3-4 cups a day including sugar and milk. My skin never looked worse like during these days! Since I am working from home, I very rare have a coffee and mostly just to take some shots ;p my skin improved soo much it’s unreal. I am recently drinking Skinny Coffee and it’s really great as it helps me loose weight at the same time! Bonus! All about Pastel Pink hair and best products to dye at home. Alternative DIY wall Christmas tree for small rented spaces. You look amazing and the tips you have shared are really useful. Great tips, I think I need to follow all of these. And the skinny coffee sounds great! wow there is no way I would have said you were in your 30s so whatever you are doing obvs works! Such a great post, girl! I follow almost all these rules, and yeah, I'm 31 now, but I see how other people look like on their earlier 30s, so I assume I'm doing it right! You sure have it down pat at such a young age. It sounds like your skin is going to be in great shape when you get older.